Mina, her husband and staff are thoughtful, helpful and go above / beyond to ensure their guests have an incredible stay as well as the best time possible in Mykonos. The best place i ever been. Everything is perfect. Thanks again for everything! The room is super nice, next to amazing beaches and bus stop to go to town. Mina and her husband are truly amazing people, helped me out for everything. Thank you so much! Everything about this hotel and it's staff is first class. A very easy walk to either plati yalos or psarou beach. I especially appreciated the transfer service to/from the port at no additional charge. Bus stop is just s few meters down the street. Close to the beach and relaxing Quieter area Very friendly owners. Mina and ger husband were excellent host . They are so kind and nice people. Lock in a great price for Mina Studios – rated 9.4 by recent guests! One of our best sellers in Platis Gialos! Located just 400 feet from Platis Gialos Beach and 1,000 feet from Psarou Beach in Mykonos, the family-run Mina Studios offers accommodations with free WiFi. A variety of restaurants, taverns and mini markets can be found within a short walk from the property. Each unit is fitted with a flat-screen TV while some are self-catering with either a kitchen with oven and hobs or kitchenette with hobs. Upon arrival, guests are welcomed with a refreshing drink or coffee/tea. The family owners offer a personalized service combined with a relaxed atmosphere. A bus connecting to Mykonos Town, which is just 2.2 mi away, stops 150 feet from the property. Frequent boat trips connect to the southern beaches of the island. 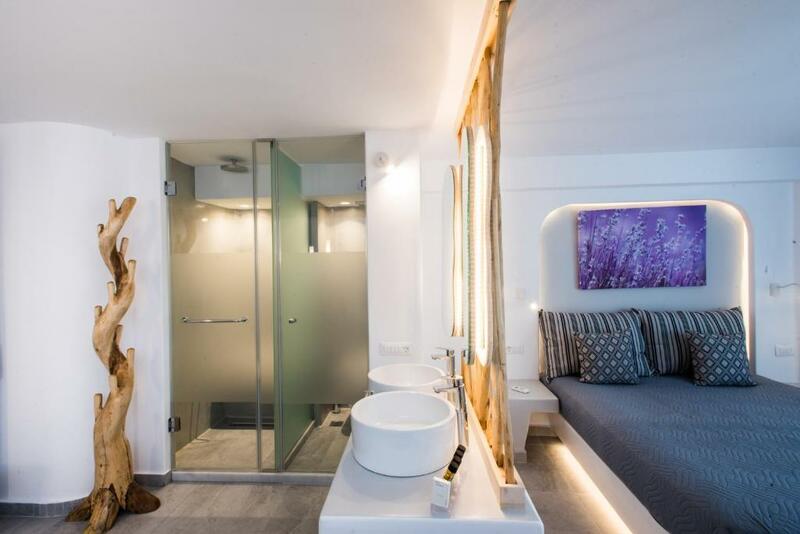 The nearest airport is Mykonos, 1.9 mi from the accommodations, and the property features airport or port shuttle service. 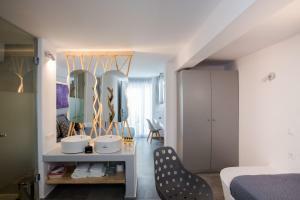 When would you like to stay at Mina Studios? This split-level apartment comes with a private veranda and a small balcony with sea view. It includes a kitchenette with mini oven and hobs, a fridge and dining area, as well as a WC, and a sofa bed. On the upper floor a double bed and a bathroom with a shower are featured. Free WiFi is provided. This is a semi-basement and air-conditioned studio opening to a furnished patio. It includes a kitchen with oven and hobs, a fridge and dining area, flat-screen TV. This room can accommodate an extra bed. Please note that maximum occupancy is 6 people, please check extra bed policy for additional charges. The rate shown is for 5 people. 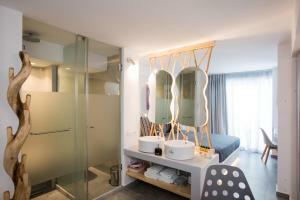 A very bright, air-conditioned room, on the 1st floor featuring modern decoration. It comes with 2 balconies and 1 window with partial sea views, queen size bed, a single sofa bed, mini fridge, closet room, satellite flat-screen TV and furnished balcony with partial sea view. 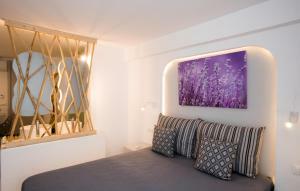 A very quiet ground floor room, in bright colors, with a queen bed and a single sofa bed. It features a satellite TV, air conditioning and a shared, furnished patio. 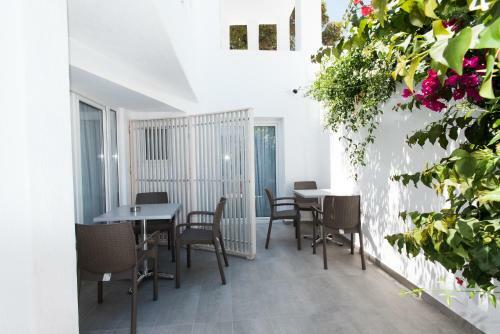 This apartment consists of two rooms and a spacious, furnished veranda. 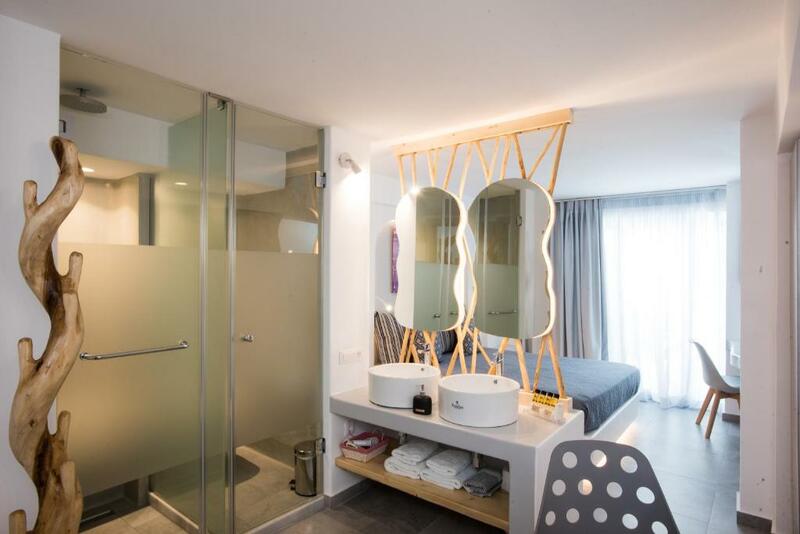 One room has two single beds,a table with chairs and a kitchenette with hobs,while the second room is a bedroom with a large double bed and private bathroom with shower. Maximum occupancy is 4 guests. Opening to a spacious private balcony, this room includes a queen sized double bed. Please note that this room type cannot accommodate an extra bed. This room has a double bed and a sofa bed with two single beds, a kitchen with oven and hobs, dining area and a large veranda. Maximum occupancy is 4 guests, please check extra bed policies for additional charges. Please note that this room type is located on the basement. It has a window, but no balcony or access to the garden. It has a queen sized double bed and guests can use the patio of the reception. It is a connecting room with a deluxe triple with Patio. This air-conditioned room features a flat-screen TV. It has a queen sized double bed and 2 sofa single beds. The rates are for 3 people. This room can accommodate an extra bed. Please note that maximum occupancy is 6 people, please check extra bed policy for additional charges. House Rules Mina Studios takes special requests – add in the next step! Mina Studios accepts these cards and reserves the right to temporarily hold an amount prior to arrival. Please inform Mina Studios of your expected arrival time in advance. You can use the Special Requests box when booking, or contact the property directly using the contact details in your confirmation. Great service, rooms and breakfast. Clean and right next to the bus stop to Mykonos. 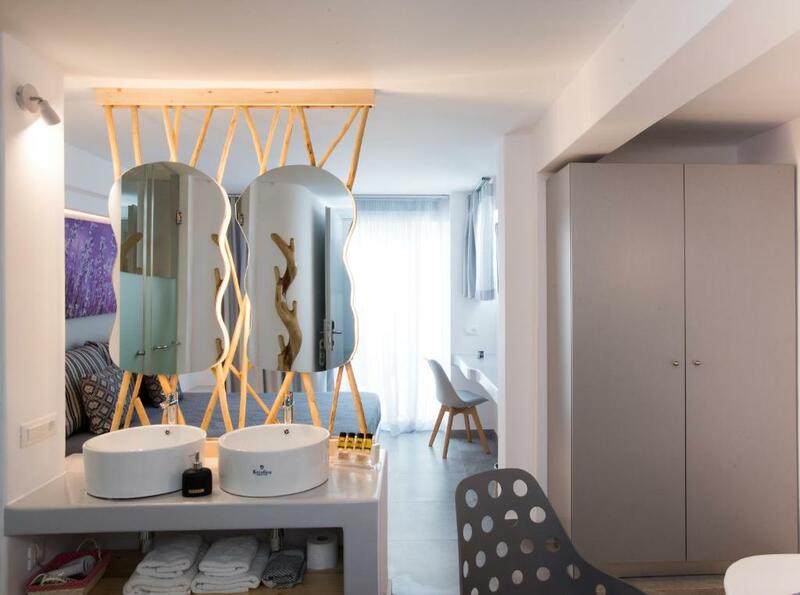 Nothing to dislike, Mina Studios is a wonderful place to stay. From the moment we were picked up from the port Mina and her husband Kosmas treated us like family. We went at off peak season so the area was quiet with a few places already closing down. Could not recommend this place anymore. If you stay in Platis Gialos you must stay here. Property is super close to Platis Gialos beach with the bus stop to the city taking you to the city in 8mins. Super quick. Room was big with air con, large tv and breakfast was amazing cooked by Kosmas himself. Very helpful at organising stuff for you and giving suggestions and going the extra mile. Felt more like a home stay than a hotel. Couldn’t fault our stay. Great value for money, location and service. Mina and her husband Cosmos were incredibly warm, welcoming and helpful. The studio was newly renovated, clean, and modern. Location was perfect. It’s walking distance to Psarou, Platis gialos, and basically all other beaches along that side of the island. It’s also a 2 min walk to the bus stop that takes you into Mykonos town for €1.80! Beautiful, clean, comfortable room, lovely hosts, yummy breakfast - we would definitely stay again/recommend Mina Studios. The hosts, both Mina & Cosma where the perfect hosts. We where collected from the port. We were given excellent information about the island and how to move around by Mina. Mina always with a smile in her face on happy to help and answer any questions to assist you in having the best vacation ever!!! Lovely apartments, very well organized, and clean, comfortable bed, nice shower, friendly staff and very helpful. The owners are very nice and very friendly. We got picked up at the airport free of charge. Great location, close to the beach and bus stop is just in front. Good breakfast. Mina and her husband were very welcoming and personable people. They helped us with the logistic of our itinerary and recommended attractions to visit in Mykonos. 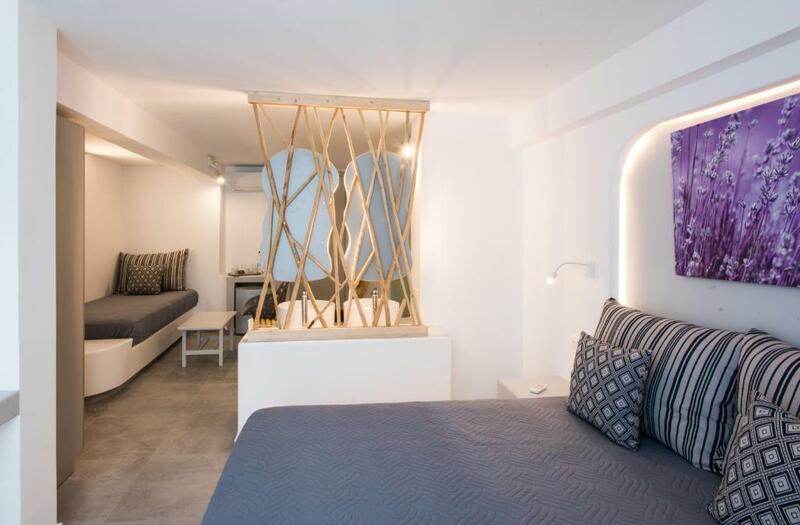 The studio apartment was at conveniently located near the Platis Gialos beach and footsteps away from the bus stop that goes straight to Mykonos town in 10 minutes. This location would be ideal for travellers looking to experience a good balance of Mykonos town as well as the beaches in Mykonos. At your stay here you must try their homemade ham and cheese omelettes! They were Awsome! Bathroom was a little small and shower cabin was missing a door, so the floor was always getting wet. However, it was cleaned up everyday. Hotel is only 1 min walk away from the beach as well as the bus station. Bus to the city only takes 15 mins. Dining suggestions of Mina were excellent (both at the beach and at the city), esp. the sea food platter. Staff was very attentive during breakfast, which was free and freshly made. Free airport transfer and beach towels were provided.